NAACP 40th Annual Convention Opening session, Second Baptist Church, Los Angeles, 12 July 1949. 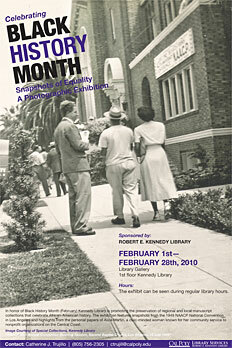 In honor of Black History Month, the Cal Poly Kennedy Library is presenting the photographic exhibition “Snapshots of Equality.” The exhibition features snapshots from the 1949 NAACP National Convention in Los Angeles as well as highlights from the personal papers of Alice Martin, a civic-minded woman known for her community service to nonprofit organizations on the Central Coast. Images featured in the exhibition are just two of many collections housed in Special Collections. The NAACP and Alice Martin collections are open for research. You can learn more about these two collections in the links below. It's Thursday! It's 2:49pm right now.